Precast panels are constructed off-site, then transported and installed on a prepared base. MICHAEL L THOLEN* provides an insight into the design and construction of low- and high-volume roadways, while highlighting that concrete pavements provide solid performance for years. Growing populations along with impressive economic strides are placing increased demands on infrastructure in the Gulf region. The World Bank’s biannual Gulf Economic Monitor, released in November 2018, reported that “a sustained increase in oil prices over the past two years has driven an economic recovery in the Gulf Cooperation Council (GCC) countries, but government-led reforms need to continue to keep up the momentum”, with reforms including investment in infrastructure. Given the increased focus on developing road infrastructure, concrete pavements can offer many advantages in setting up a reliable network. Concrete pavements are stiff enough to minimise subgrade deformation by spreading loads over large areas of the subgrade; are wear-resistant and durable; and can be constructed with the desired level of smoothness. Concrete pavements can be especially beneficial in hot climates, provided appropriate measures are taken during construction. For example, these pavements can have a positive impact on urban heat island effect (UHIE) – a condition in which air temperatures are measurably warmer in urban areas than they are in nearby suburban or rural areas. Concrete’s light colour and high albedo are responsible for the increase. Another advantage of concrete pavements, when built in hot climates, is that they are rigid and do not experience softening; therefore, they resist deformations under the weight of heavy vehicles. Despite its advantages, concrete paving in hot weather can present challenges. The fresh concrete can experience rapid slump loss. Excessive heat and dry winds during concrete production and placement can affect moisture content and curing, which in turn increases the likelihood of shrinkage-related cracking. Sources of moisture loss in concrete during hauling and placing include water absorbed from the mix by dry aggregates. Dry subgrades may absorb moisture from recently placed paving material, affecting curing; similar curing issues may occur if hot subgrades raise the temperature underneath the paving. If the ambient temperature is high during the time of construction, concrete may experience rapid evaporation at its surface. Workability times are also reduced in hot weather, limiting the amount of time available to work crews for finishing and texturing operations. Precautionary measures during hot weather can mitigate the effects of these challenges. These include paving during cooler times of the day (or at night) and/or using physical barriers such as sunshades to reduce localised temperatures. Water can be sprayed onto aggregates, formwork, equipment and the road’s subbase, as necessary, to maintain cool temperatures. Admixtures can be used in the concrete mix to slow hydration, and in extremely hot weather, ice water may be used in the mix. Curing compounds, which seal the concrete and reduce the rate of evaporation, need to be applied soon after the concrete is finished and textured (tined). Low-volume roadways are generally defined as roads that are subject either to heavy loads but few vehicles, or to light loads and many vehicles. The types of concrete pavements that offer a good solution for low-volume roadways include plain jointed, reinforced jointed or continuously reinforced concrete pavement (CRCP). CRCP does not have joints; it incorporates longitudinal reinforcement that induces cracking in the pavement at 1- to 2-m spacing and then helps keep the cracking tight. Roller-compacted concrete (RCC) is also a good choice for many pavements, being economical and very fast to construct. RCC gets its name from the heavy vibratory steel drum and rubber-tyred rollers used to compact it into its final form. It has similar strength properties and consists of the same basic ingredients as conventional concrete, but has different mixture proportions, most notably a higher percentage of fine aggregate that allows for tight packing and compaction. RCC requires no forms, dowels or reinforcing steel yet is strong, dense and durable. American Concrete Institute’s ACI 327R-14: Guide to Roller-Compacted Concrete Pavements provides further details. For rehabilitation of existing pavements – even asphalt pavements – hydraulic cement concrete overlays are an option. Concrete overlays offer the potential for long service life, higher structural capacity, low maintenance requirements and excellent life-cycle. ACI 325.13R-06: Concrete Overlays for Pavement Rehabilitation provides information on the use of concrete overlays for the rehabilitation of both concrete (rigid) and asphalt (flexible) pavements. Concrete slabs, not the road subbase, carry traffic loads (although the base layer is important for providing uniform support for the slab, preventing faulting and promoting subsurface drainage). Therefore, slab thickness must be carefully designed to limit the tensile stresses and slab deflections that occur during vehicle loading. When determining slab thickness, pavement designers should consider concrete strength, support condition at the base, joint spacing, load transfer at joints and traffic loading. Inadequate slab thickness can lead to premature concrete cracking and poor performance of the concrete pavement. Concrete mixture proportions for paving can be developed using the methods described in ACI 211.1: Standard Practice for Selecting Proportions for Normal, Heavyweight, and Mass Concrete. These proportions can influence workability during placement and affect flexural strength, durability and skid resistance in the hardened state during service. Because concrete roads experience the highest stresses when loads are applied near slab panel edges – as opposed to loads imposed at the interior of the panel – joint spacing and construction and load transfer across the joints are critical considerations. Joint types typically include contraction, construction and expansion joints at bridges. Proper transverse joint spacing is determined based on several factors including pavement thickness, concrete tensile strength, aggregate type (coefficient of thermal expansion), and climatic conditions. Research has shown that concrete pavements for low-volume roads perform best if they are configured with short joint spacing patterns that result in small openings at the joints. This is because, for joints without dowels, load transfer is accomplished through aggregate interlock across the joint. Small openings also reduce the number of incompressible materials that get into joints and cause pavement blow-ups. The use of joint sealants is typically considered unnecessary for low-volume roads and may not be cost-effective in dry climates. Surface drainage should effectively prevent ponding and direct run-off away from pavement edges and joints. This minimises the infiltration of water to the subgrade, where it could be trapped beneath the pavement and erode the subbase. Positive surface drainage measures such as 2 to 2.5 per cent transverse surface slopes and adequate drainage ditches should be provided. Local soil conditions should be addressed when designing concrete pavements. Prework includes soil classification to determine liquid and plastic limits, moisture and density properties, and soil swelling characteristics. Details on construction of concrete pavements are available in ACI 325.9R-15: Guide for Construction of Concrete Pavements and ACI 325.12R-02: Guide for Design of Jointed Concrete Pavements for Streets and Local Roads. Concrete pavements are generally preferred for high-volume roadways for the reasons already discussed. For high-volume roadways, concrete pavements may be JPCP or CRCP. In recent years, RCC has been increasingly used for highways. For existing expressways or other heavily travelled urban roads, alternative construction methods for pavement rehabilitation or reconstruction may deliver the best results. The goal in these applications is to provide high-strength, durable pavement surfaces that are constructible on an accelerated time line. Efforts include deploying precast concrete pavement (PCP) in these situations. Precast panels are constructed off-site, then transported and installed on a prepared base. The process reduces curing time in the field, allowing for night construction that minimises disruption to travellers during peak daytime travel hours. It is typical for work to be performed in single lanes, avoiding detour situations. PCP is a relatively new technology. The first two full-scale projects in the US were constructed in 2001. Since then, significant technological advances have been made that have increased panel installation productivity and reduced overall cost, even though many projects are being constructed by contractors with no prior experience with PCP. There are several different PCP systems available. Although these systems may be different with respect to certain aspects of design, fabrication, and installation, they share many common features and requirements. The differences in the systems typically relate to how the load transfer is achieved at transverse joints and the provisions for placing the panels over the prepared base (support condition). PCP systems can be installed rapidly and can be expected to provide long-term service. Over their service lives, PCPs are similar to conventional cast-in-place concrete pavements. Their expected service life may range from approximately 20 years or more for repaired areas and 40-plus years for continuous applications, without significant maintenance needs. 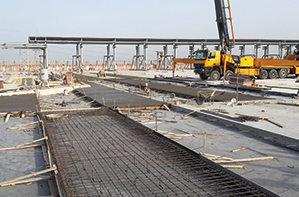 Conventional vibrated or self-consolidating concrete can be used to manufacture panels. ASTM C150, Type I or Type II Portland cements are most commonly used in the panels, although supplementary cementitious materials (such as fly ash or slag cement) often replace part of the cement because they can improve durability. The support condition under the precast panels is critical. When preparing the base for PCP installation, existing granular bases can be regraded and compacted or a new base may be constructed. A bedding layer (or interlayer) is used to ensure contact between the smooth bottom of a panel and the base – these two surfaces will not match each other perfectly. The choice of this interlayer material is affected by the way the panels are installed. The bedding layer may be a thin layer of cemented granular material or cemented sand or a thin layer of fast-setting flowable cementitious grout in conjunction with a panel levelling lift system. For replacing individual panels in an existing road, or for performing full-depth repair at a joint, reinforced panels or prestressed panels can be installed singly. For continuous applications, jointed PCP (JPrCP) systems can be constructed from reinforced panels or prestressed panels, or a post-tensioned system can be constructed. Known as prestressed precast concrete pavement (PPCP), the post-tensioned systems have much longer sections (and therefore longer joint spacing); they also require thinner slabs than JPrCP. Post-tensioning strands are bonded to the concrete through grouted tendon ducts. For JPrCP, dowel bars placed along wheel paths are typically used for load transfer between panels. PCP advancements continue to be made in design and installation. PCP has a strong track record for heavily travelled roads where reliable results are required in an accelerated timeframe. Overall, concrete roads are a good solution for road owners. Long-lived and low-maintenance, concrete pavement provides solid performance for years into the future. *Michael L Tholen is managing director, Engineering & Professional Development of American Concrete Institute.